Something new! Share-A-Craft is just as much fun as a tilt-a-whirl, but with less stomach upset and possible vomiting. I'm going to be sharing something I've made on a regular basis. I make a lot of things that never make it to the blog, because I'm not always the best at picking up my camera. This will force me to get pictures. If you want to share right back, I'd love to see what you've been making recently. Today's project is a wedding cake for an open house. My mom has been helping her friend (the groom's mom), plan the open house for a while now. My mom did the most incredible mural for it that I will have to share at some point. Anyway, they had someone making their cake, but they backed out at the last minute, so my mom asked me if I would help. That was on Wednesday afternoon. The open house was at Friday at six. I was in a cake decorating kind of mood, so I said yes. Two days is not a long time to make a cake this big, even with the bottom two layers being dummy cakes. I guess I could have gone smaller, but that's not my style. Be bold or go home. Go big or die. Those types of "or" statements are the framework for my crafting philosophy. Really, I just like challenging myself, and I LOVE impressing others. It's almost a sickness. Hence the blog. I'm not sure how well I succeeded here. My vision was big, but my time was short. I ended up rushing the most involved and time consuming steps. I figured it would take me about 3 hours to pipe it the way I wanted and I ended up with only an hour to do the piping (it's rather messy as a result). I wanted to do more of a ribbon band around the bottoms, with pipping along the bottom and the sides, but I ran out of time and had to the snake rolled things. In the end though, I think it turned out cute and whimsical, which fit the rest of the open house, which was Disney themed. I will have red palms for a week from the food coloring. 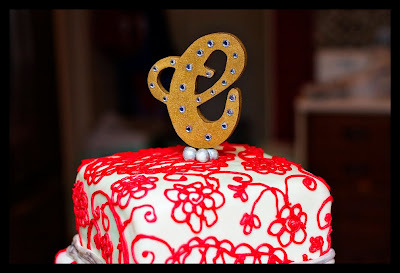 One thing I am very proud of is the monogram. I cut it all out myself on a scroll saw and drilled the hole in the bottom for the dowel. I usually leave those types of things to David (he built me the base), so go me for doing it all by myself. Very cool! So were these the real cake layers, or is the cake deceptively small in the pictures? 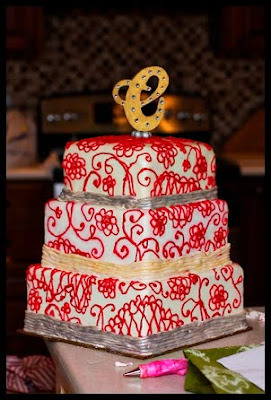 I love that wedding cakes have so much color now. When I got married everything was still pretty much all white. They are real cake layers. The bottom layer is 12x12x5", then the middle is 10x10x5" and the top layer is 8x8x5". To give you an idea, only the top layer is cake and I had to bake two batches of cake to have enough to get the size I wanted! It's pretty big. OMG! It's beautiful! I could never do something like this!